Oh how this show fills me with emotions. Adventure Time is ending soon, with the final episode – “Come Along With Me” – set to air in June. We’ll get to see a war waged between Princess Bubblegum and her family, echoing the Mushroom War that triggered mass destruction, the sharp decline of the human race, and the rise of the strange creatures of Ooo. The show’s depth is immense, packing a ton of meaning into some memorable characters and storylines. Now if we’re talking politics, it’s easy to point to Bonnie Bubblegum – as the Princess of the Candy Kingdom, she’s the head cheese of some lovely, if not misguided, individuals. She’s loving and supportive, and her people adore her. Her sharp contrast comes in the form of Lemongrab, a screaming despot obsessed with excess and control. But… something’s not entirely right here. If you look closely, you’ll notice something shocking: Lemongrab and P.B. are two halves of the same despot. Lemongrab is, in a phrase, a piece of work. In the episode “You Made Me” (season 4, episode 20), he blames his loneliness on his personality, but does not take steps to reach out to other sentient creatures. Lemongrab instead chooses to stand quietly in the dark and watch others sleep – he feels that it’s a good way to get in social interaction without having to, you know, interact. He refuses to see the perspective of others nor his own damaging management style, choosing instead to scream at P.B., “You have excess candies. You must donate! DONATE!… I am alone, and you made me like this!” Rather than adapt to life with other people, he chooses to blame his version of God because no one caves to his demands. Once he gets volunteers to come live with him, he proceeds to torture the Notorious Pup Gang. Keep in mind, the Notorious Pup Gang volunteered to go live with him to meet the demand that he has subjects, with conditions of money and an expunged criminal record; these kids aren’t there because they feel badly for Lemongrab, or want to make a noble sacrifice for the betterment of their people. P.B. arrives and creates a clone of him; once he has a perfect replica of himself, he allows the Notorious Pup Gang to leave. However, he retains the need to control others, and creates more subjects without thinking through the ramifications of his actions in the episode “All Your Fault” just one season later (season 5, episode 9). After blowing through their food stash, P.B. sends the starving Lemongrabs seeds so that they can grow food and provide for themselves, oblivious to the fact that they’ve been changing their food into new lemon candies. The Lemongrabs promptly change the gifted seeds into a deformed new candy being, despite that everyone is clearly starving. The Lemongrabs have not learned from their experiences, screaming continually that the princess is to blame for their lack of impulse control and proper planning. They continually create life and problems with no intention of accepting culpability nor of fixing a self-inflicted mess. Later in that same season, we see the darker side of Lemongrab as the original splits from the clone in terms of political rule. In the episode “Too Old” (season 5, episode 31), the original Lemongrab has ballooned to a grossly obese tyrant. 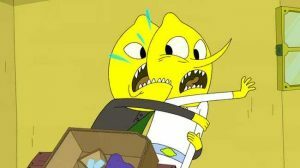 The second Lemongrab, by contrast, is missing a chunk out of his head and tries to share food with another citizen, who has had his food stolen by the tyrant. The seeds of discord can be seen in the conflicting appearances and ruling styles of the two, coming to a head when the tyrant screams at young artist Lemonhope, “I’ve tried imprisoning! I’ve tried reconditioning! 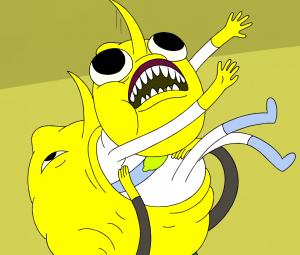 You leave me no choice!” The original Lemongrab is a brutal dictator that uses torture and brainwashing to control those he rules, whereas is clone is far more sympathetic and subversive. The citizens and the clone allow Lemonhope to escape, but many are consumed in the process, demonstrating the terrifying power of the oppressor. The conflict culminates in “Lemonhope, Part 2” (season 5, episode 51) when the original Lemongrab faces a rebellion from inside of his own belly (which is a loaded statement if I ever typed one), with the consumed clone version of Lemongrab instructing Lemonhope to play his harp to cause an explosion that ends the original Lemongrab’s rule. So, what on Earth would someone like P.B. have in common with a guy like that? In the grand tradition of Adventure Time, it’s way more complex than you’d originally think. P.B. prides herself on being a scientist, which is admirable until you realize just how warped her sense of scientific progress goes once paired with her compulsive need to create new life. She refers to Lemongrab as her “first” experiment with creating life. P.B. not only created Lemongrab, but every candy person – all helpless individuals who are known for being dim-witted and heavily reliant upon her for even the simplest of decisions, from Cinnamon Bun’s need to eat to Cherry Cream Soda’s pairing with Root Beer Guy for marriage. 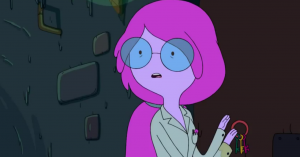 While this can be dismissed as a caring creator, she goes a bit too far in the episode “Goliad” (season 4, episode 8) when she creates an heir to the candy throne in while using her own DNA. She whispers to Finn, “I’m not going to live forever, Finn. I would if I could.” She needs someone just like her to take over, with the implication being that she does not have faith that anyone else could do her job the way she specifies. Arguably, this is a problem of her own making: if she wanted more self-sufficient candy people, she should allow them to grow rather than coddle and micromanage them. She chooses instead to synthesize a new supreme leader, and the result is a psychic child with a need for absolute control. Goliad is only placed in check with the creation of Stormo, a heroic creation with the key difference of stemming from piece of Finn’s hair (non-consensual theft and creation of a child, I might add). P.B. is pretty guarded about the knowledge of the creation of life, choosing in “All Your Fault” to literally crack the Lemongrabs’ heads open to erase the life-creation formula from their brains. She has a need to control who has power equal to hers, which we see much later in her interactions with her own family. In the episode “Bonnibel Bubblegum” (season 10, episode 4), she recounts how she felt she needed people “like me” growing up and created Uncle Gumbald, Aunt Lolly and Cousin Chicle. When they don’t prove to be as docile as her brother Neddy – who is a very thinly-veiled special needs child, right down to the name being one letter substitution away from “needy” – she changes them into the easily-controlled candy people via something that’s referred to as “dum dum juice”. She literally dumbs down the intellect and physical appearance of her rivals to make them more controllable. Control freak, you have a call on line one. In fact, P.B. makes a habit of controlling the lives of others, particularly if she assesses a threat. While this quality isn’t entirely bad, she does a few things that serve her own interests and power rather than the well-being of others, with the possibility of a different outcome easily dismissed. Case in point: her tumultuous relationship with Flame Princess, whom she has imprisoned for most of Flame Princess’s young life due to the threat she assessed when the girl was a baby. 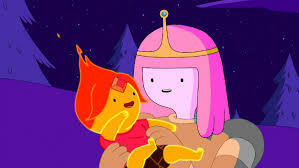 When Flame Princess then engages in a romantic relationship with Finn in “Burning Low” (season 4, episode 16), she attempts to break up the pair, causing resentment from a confused Finn, who fought for quite some time to dispel a romantic attachment to P.B. In fact, all P.B. does in this episode is meddle – she’s busted collecting taxes (read: stealing treasure) from Finn and Jake, then tries to break up Finn and Flame Princess without bothering to reassess Flame Princess’s abilities or her interactions with Finn. She eventually locks the girl up again during her painful adolescent split with Finn in the episode “Earth and Water” (season 5, episode 32), going so far as to trick the girl into believing that she wants to be her friend. Ultimately, it’s Cinnamon Bun – a creature regarded with condescension as being “half-baked” – who helps balance Flame Princess, providing a sense of growth and partnership P.B. had previously dismissed, but not before spying on Flame Princess and placing the well-being of the flame people in serious jeopardy in “The Cooler” (season 6, episode 22). Rather than talk it out, P.B. consistently chooses surveillance, trickery and sabotage to achieve her ends, even if it runs the risk of killing an entire kingdom. Most damning, however, is her treatment of the Notorious Pup Gang in “You Made Me”. 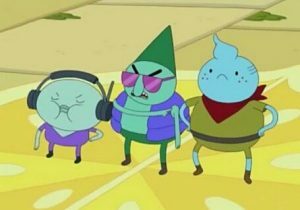 After looking for volunteers to go live with Lemongrab, she accepts the gang’s demands for an expunged record and a cash payout, glossing over something we take for granted: the Notorious Pup Gang is comprised of three children. Princess Bubblegum sends three little boys to go live with an unstable, abusive, extremely controlling individual, and it never once dawns on her that they could be placed in danger. When Finn and Jake show up to rescue the boys, they’re found locked in a room while being continuously electrocuted. And never once does P.B. have to answer for the fact that she sent children to be tortured. The kids might be assholes, but no child deserves to be tortured, no matter how many people it saves. Especially when you take into account that their main motivation was a troubled childhood and misguided hope for parental affection through monetary payoff. She doesn’t apologize, and she doesn’t consider the possibility of something bad happening to them; P.B. just wanted her political problem to go away. Like it or not, P.B. sold three kids off as slaves to a vicious dictator. That’s not a benevolent ruler doing things for the good of her people. That’s a special shade of soulless political figurehead. They’re punks, but they didn’t deserve it. P.B. 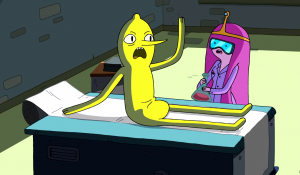 might not scream the way that Lemongrab does, but make no mistake: she functions without consent, without regard for the happiness of others, and with an extreme need to control others to meet her agenda. She may be the pretty princess in the pink dress, but P.B. is just as much of a tyrant as Lemongrab. They’re two halves of the same whole: the obvious villain and the not-as-suspect puppetmaster. Sometimes, you need to realize when your tyrant has been sugar-coated. The pretty princess can be just as much of a monster as the screaming, overt bully.